These origami fans are so easy to make! They make great decorations at parties and weddings, you can also make little origami earrings with these! 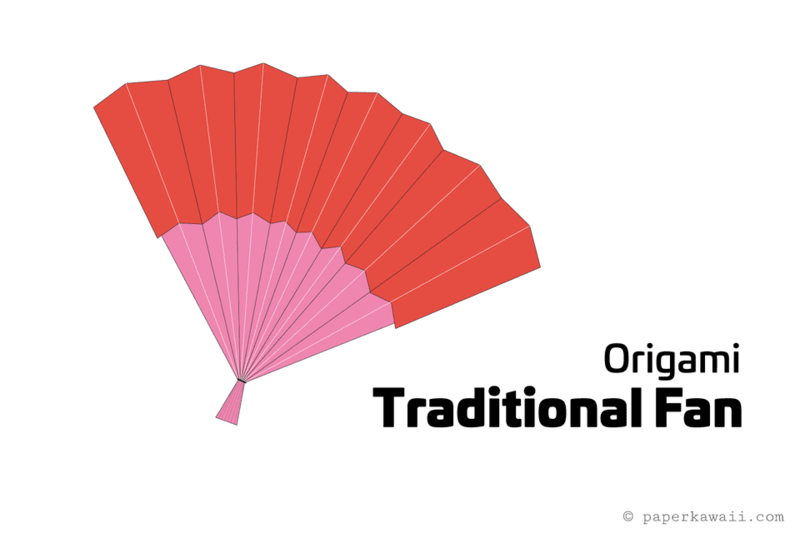 This traditional origami fan is a great choice if you are a beginner at origami. Lately there has been lots of origami jewellery featured in magazines - these origami fans are a really fun choice as earrings, especially if you use a fun colour and also waterproof it too. For a fun rainy day activity for kids, why not set up some large square paper, get them to paint it, and when it's dry, you can help them fold it into beautiful origami fans. Afterwards you can string beads onto a ribbon to attach to the bottom, or add glitter or sequins to make it even more elaborate. You will need one sheet of square paper, but it will also work with any sized paper, printer paper, wrapping paper etc. Click here for some great ideas of paper around the house that you can use for origami. 1. Starting white side up if you have one. Fold the paper in half, top to bottom. Now fold the top edge down to the central crease and unfold. 2. Next, cut of the top section, leaving you with the paper being 4 by 3. 3. Refold the crease at the top. 4. Fold the paper in half, right to left and unfold, this is creating the vertical central crease. 5. Fold the left and right edges to the vertical central crease and unfold. 6. Next, fold the right edge to the leftmost crease and unfold. 7. Then fold the left edge to the rightmost crease and unfold. 8. Fold the left and right edges to meet the last two creases you made. Now you have 8 equal sections. 9. Flip the model over to the other side. Now fold the sections in half again. You can do this by picking the paper up and folding it into an accordion. 10. Flip the paper back over to the other side. 11. Make sure the edges all align nicely and flatten into a long accordion. Tie the bottom end with tape, string or elastic etc. 12. Now you can pul out the top of the fan and it's done! You can get different shapes by tying the fan lower or higher at the bottom. II hope you enjoyed the tutorial, why not check out this origami standing fan, traditionally made with a napkin?